As the bench grinder is not only a power tool but one with openly accessible spinning parts, precautions need to be made. Have a tutor show the machine to you before touching it! approach the spinning wheel slowly so your workpiece doesn't catch on it! when sharpening hardened steel make sure to keep the blade cool, otherwise previous hardening may be undone! This bench grinder from 1996 is used but still in decent condition; the wheels run true and quietly. The grinder is equipped with two different stone wheels with different grits (35 & 60); one for heavy-duty and quick material removal, one for a finer and more precise material removal that will leave a way nicer surface finish. The wheels need to be "dressed" from time to time in order to produce nice straight edges and maintain stability. Apparently, it's possible to do that with nothing more than a few spring washers on a piece of threaded rod! We should try this before spending time and money on a more sophisticated tool. After installing a new grinding wheel, set up a safety perimeter (let's say everyone leaves the room) and let the grinder run for five minutes. Only if that went well, without suspicious noises or visible signs of problems, should the grinder be used again. 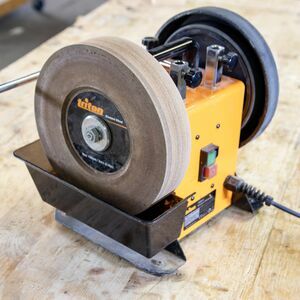 For really sharp knives, we could turn an MDF wheel on the wood lathe and use that as the final "grit". The Triton TWSS10 provides a stone for wet grinding. Please ensure you always empty the water when you are done! This grinder is slow moving and intended for the final sharpening passes, not gor quick material removal. It has a 220 grit "diamond wheel" (with a water bath) and a leather honing wheel. There are quite a few accessories available from the manufacturer. You can find them in the manual (page 8) as well as on the product page. We should document individual accessories as we get (or 3D print) them. We have a straight edge jig for flat irons like bevel edge chisels or plane blades. This page was last edited on 7 November 2018, at 19:42.